Meet the cutting edge abode that aims to end global homelessness. Now, more than ever, sustainability and affordability are at the forefront of the minds of the world’s most innovative builders and designers. From solar-powered eco-capsules to tiny minimalist huts and mobile prefab homes, housing is officially taking a turn toward the future. Adding their inspired voice to the mix is New Story, a San Francisco-based non-profit that’s hoping to put an end to global homelessness with their life-changing model, which takes just 24 hours and a mere $4,000 to make. Their secret? The homes are constructed using a 3D printer. 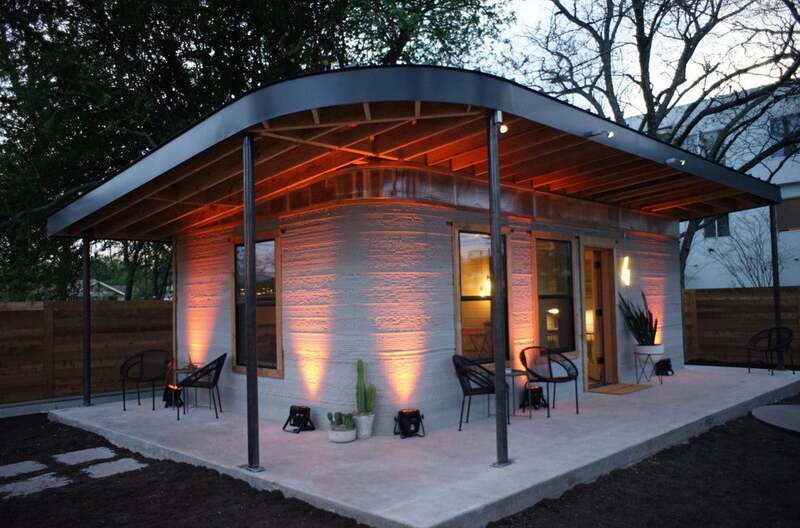 In partnership with ICON, a forward-thinking construction technologies company, the organizations debuted the first permitted 3D-printed house in Austin, Texas last week. Focused on transforming slums in the developing world into thriving communities, ICON and New Story are determined to solve the global housing crisis by providing safe and affordable shelter for people across the world who don’t have a place to call home. Over a billion people worldwide live in inadequate housing, with poor sanitation and little to no protection from extreme weather conditions. Designed specifically with affordability, building performance, and customizability in mind, the game-changing model will help provide homes for those in underserved areas faster (and cheaper) than ever. With the assistance of advanced robotics and a portable printer dubbed “The Vulcan,” the companies will be able to construct sturdy habitats at an unheard of rate—and, more importantly, build them in areas like Haiti and rural El Salvador, where water is limited, labor assistance is scarce, and power is unpredictable. Ranging from 600 to 800 square feet, the streamlined homes will cost approximately $4,000 to make. And though the printer can design nearly any 2D floor plan imaginable, the recently-debuted version in Austin—which boasts a living room, bedroom, bathroom, and covered porch—serves as a straightforward approach that will ultimately meet the needs of millions of people. Considering human-built houses of equivalent size would take anywhere from 15 to 20 days to build, this tech-savvy solution will undoubtedly revolutionize the way other similar nonprofits and government organizations build. The organization hopes to begin printing homes in El Salvador in 2018, and then, through partnerships, scale up production and begin building in other communities in the coming years. While certainly exciting news, the 3D-printed houses are simply New Story’s most recent venture: The organization has built more than 850 boldly beautiful homes for families in Haiti, El Salvador, Mexico, and Bolivia since its founding in 2015. Thanks to a dedicated team of volunteers and local workers, families in Labodrie, Haiti—who had previously been living in tents or makeshift shacks following the 2010 earthquake—now have access to clean water and proper bathrooms, and live in healthy, reliable houses with concrete floors. This frees them to focus on income, education, and other similar opportunities, rather than simple survival or finding decent shelter. Want to learn how you can help? You can donate to their cause or sponsor a family directly by visiting their website, or keep up with their latest projects and trips by following New Story or ICON on Instagram.